Boy howdy, this one is sweet. And I mean literally sweet, not sweet as in "rad." It's a bit much, honestly. I made the mistake of drinking this alongside Weyerbacher's Imperial Pumpkin, and this one definitely suffers for the comparison. It's not just sweet, it tastes sweet — a distinction that's probably hard for me to really capture in words, but this one has that strong toffee candy sugar taste. The flavor settles down a bit once the beer warms, letting the spices show through, and at that point it's clear that Schlafly's pumpkin is actually pretty well spiced, deep down in its heart. I picked up a sixpack of this while attending a trade show in Indianapolis, and drank most of the sixpack while there. But being the intrepid beer blogger that I am, I brought a bottle back to review. Schlafly isn't available in the New York area, but I'd often heard good things about it. 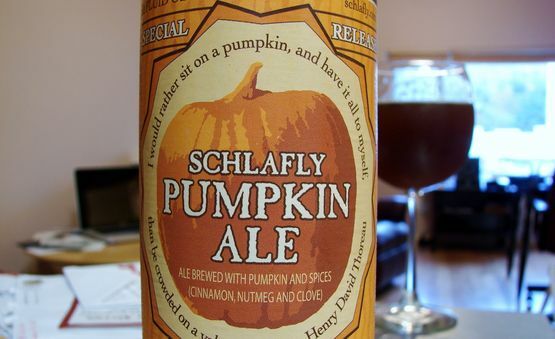 It's one of the highest rated pumpkin beers on Beer Advocate. And I guess, as far as the deep-down flavor goes, this one is brewed pretty well. I just can't get over how sweet, rich and syrupy it is. It's like the exact overboard version of Weyerbacher's pumpkin, which is blessedly light and dry in comparison. This could be a lot worse — it's a good flavor that's way too sweet, as opposed to just a bad flavor — but I certainly wouldn't fly to Indianapolis just to pick this one up. I love the packaging.. although your picture should not have cut off the quote!